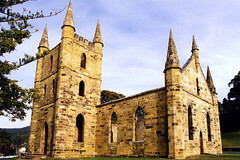 Convict church at Port Arthur Historical Site, Tasmania. I didn't always think so. When I was in high school, history was my least favourite subject by far, even more so than PE. I suspect this was mainly due to the teachers I had, both of which I found horrible. In primary school we learnt some history too, of course—mainly Australian history—and I never had any problems with that. My parents acquired somehow (from a garage sale, I think) a big stack of comic books about Australian history. Each volume was maybe 48 pages, bound in a thin cardboard cover in which the front flap folded out and around to cover the whole thing. I seem to recall the printing was in sepia-toned ink, but that may just be the ravages of memory. The art was in a very realistic style, and the tales they told were true stories from the ages of exploration and colonisation of Australia. I learnt much of Australian history through these comics. I don't know what happened to them, and sort of wish I still had them now. When I moved on to high school, the history syllabus included more ancient stuff. There was stuff about the evolution of human beings, including the various australopithecines and Homo species known at the time. And stuff about Ancient Egypt, and stuff about the Crusades. All of this should have been fascinating, but my teachers managed to make me hate going into their classrooms so much that I conflated the experience with the subject matter, and ended up not rediscovering how interesting history was until a good ten years later. 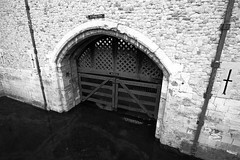 Traitor's Gate at the Tower of London. Traitors entered via this gate prior to execution. The thing about history is that there's a lot of it. And honestly, not all of it is interesting. While the daily lives of medieval peasants is interesting in an overview sort of way, the tedium of a single peasant's life in detail, multiplied by thousands of people with almost identical lives, would be a bit monotonous. On the other hand, the daily life of someone who moves in elite circles and mixes with leaders, entrepreneurs, and geniuses can reveal a lot of fascinating details about the society of the time. Samuel Pepys lived in England from 1633 to 1703. In the latter years of his life he served as a Member of Parliament, but he is more famous for what he did from 1660 to 1669. Throughout these years, Pepys kept a detailed diary of things that happened in his life and of events around him. These events included the Second Anglo-Dutch War, a major outbreak of bubonic plague, and the Great Fire of London, his diary is an intimate personal record of some of the most significant events in English history. Pepys mixed with the upper stratum of London society, becoming a confidant of Kings Charles II and James II, and friends with people such as Isaac Newton. History can be seen in different ways. As broad sweeps of empires and wars and passages of hundreds of years, or as detailed glimpses into events focused on one person, or a single day. You need a bit of both to reach a better understanding of, and appreciation for, what goes on in history. The Cuban Missile Crisis was the most significant concentrated political confrontation between the United States and the Soviet Union during the almost 50-year-long Cold War that followed the end of World War II. People my age, who grew up in the 1980s, or older, will remember the Cold War, as it cast a pall of pervasive and imminent doom over the world that affected the psyches of everyone. 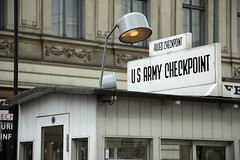 Checkpoint Charlie, Berlin. One of the only communication points between East and West during the Cold War. The Cuban Missile Crisis took place over 13 days in October 1962. The Soviets were building missile bases in Cuba, from where nuclear missiles of the day would be capable of targeting the United States. This was a reaction to the US having recently deployed nuclear missiles in Italy and Turkey, giving them the capability to target Moscow. The crisis began on 14 October, when a US spy plane gathered photos that proved the missile bases were being built in Cuba. President John F. Kennedy decided he could not allow enemy nuclear weapons within range of the US. The options were to attack or invade Cuba, or blockade it to prevent delivery of the missiles. A year earlier, in April 1961, Kennedy had authorised support for an invasion force of CIA-trained Cuban exiles to attempt to overthrow the government of Fidel Castro. The invasion force landed at the Bay of Pigs, and was completely repulsed by the Cuban forces (who were trained and armed by the Soviets) within three days. This disaster may have tipped the balance in Kennedy's mind, and he opted for a blockade. Kennedy's administration demanded the Soviets dismantle the missile bases and remove missile weapons from Cuba. The Soviet Premier, Nikita Khrushchev denounced the blockade as an act of aggression in international waters. Publicly, both leaders braced for nuclear war. The world collectively held its breath. It was known that a nuclear war would kill millions of people, horribly. This was before the discovery of nuclear winter, however, so nobody realised that a full nuclear exchange would also lead to devastating climatic effects that would potentially kill billions more and very possibly destroy human civilisation entirely. Still, even without this the threat was big enough to make everyone worried. 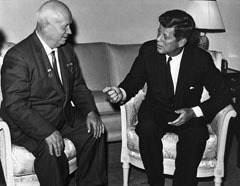 Nikita Khrushchev (left) and John F. Kennedy, meeting in 1961 in Vienna. Public domain image from Wikimedia Commons. The waters around Cuba filled with American and Soviet ships, submarines, and planes. They jostled and provoked one another. American Navy ships stopped and boarded several merchant vessels bound for Cuba, allowing them to proceed only after thorough searches. Nuclear-equipped bombers took up stations within striking range of the Soviet Union. American fighters loaded nuclear missiles. On 27 October, a Soviet surface-to-air missile shot down an American reconnaissance plane flying over Cuban airspace, killing the pilot. Fortunately, the Soviets dreaded the thought of nuclear war at least as much as anyone else, and cooler heads prevailed. The Americans figured Khrushchev would know that deliberately shooting down a plane would be inviting open war, so guessed it might have been some sort of accident. They guessed right. Khrushchev knew that shooting down an American plane would escalate the situation and had issued orders against it. The shot came from an unauthorised local Soviet commander in Cuba, acting without orders, but they only found that out later. Khrushchev opened secret negotiations behind the scenes with the US, via the United Nations. A letter from Khrushchev on 26 October appealed for Kennedy to take steps with him towards a peaceful settlement, rather than war. The Americans offered a deal, which was publicly to remove the blockade of Cuba in exchange for removing the missiles and bases from Cuba. The deal secretly also involved removing American missiles from Turkey and Italy. The Soviets found this acceptable and agreed on 28 October, ending the crisis. This peaceful end came about despite numerous incidents on 27 October, the above-mentioned shooting down of a US plane being one. This is the broad sweep of the Missile Crisis, and tells the overall story (in a simple overview - there are many important details I have left out). Obviously several individuals play important roles: Kennedy, Khrushchev, U Thant (the Secretary-General of the United Nations), various military and political advisors and emissaries. All the people you'd expect. At the height of the Crisis, on 27 October, the aircraft carrier USS Randolph and an accompanying group of destroyers cornered the Soviet submarine B-59 in the waters off Cuba. The US commanders were determined to force the submarine to the surface so they could identify it, and dropped signalling depth charges - small charges designed mostly to make noise rather than do any serious damage. However, unaware to the US commanders, the crew on the B-59 mistook the signals for a real attack. Being out of communication with their fleet and base, Captain Valentin Savitsky of the B-59 assumed that war must have broken out. He decided the appropriate course of action was to launch torpedoes at the American fleet. 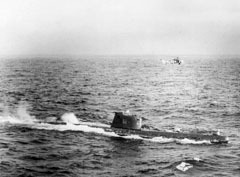 Soviet submarine B-59 after surfacing off Cuba on 27 October 1962. Public domain image from Wikimedia Commons. The B-59 was carrying torpedoes equipped with nuclear charges. A hit would have destroyed any US ship in a nuclear explosion. The US would almost certainly have retaliated with nuclear missile launches against the Soviet Union, triggering an all-out nuclear war. But Captain Savitsky did not have the authority to launch nuclear weapons on his own. The decision needed to be unanimous among him, the ship's political officer Ivan Maslennikov, and the second-in-command Vasili Arkhipov. Maslennikov agreed with the captain. Arkhipov dissented. The three engaged in an argument, in their cramped submarine cabin, beneath the waters of the Straits of Florida. An argument that could have started World War III. An argument that could have ended human civilisation as we know it. Captain Savitsky lost his temper with Arkhipov, but Arkhipov stood firm and calmly argued his captain and his political officer out of their determination to fire torpedoes. Arkhipov called for the submarine to surface and await orders from Moscow. He managed to convince Savitsky that this was the right thing to do, and so the order was given to surface. And so, very possibly you, me, and everyone else reading this right now, are only alive because of a single decision, made by a single otherwise anonymous man, in October of 1962. Be grateful for the strength of character and conviction of Vasili Arkhipov. And this is only one tiny snippet out of thousands of years of past events. Potential turning points that make you wonder what could have been, and marvel at how things have actually turned out. Stories that are meaningful not just to the individuals involved, but to thousands or millions of other people, scattered all across the globe. Astounding events that read like the greatest thrillers, or detective mysteries, or action adventures, or political intrigues, or sweeping romances ever written. And yet these things actually happened. I've written about the Cold War and how it affected daily life in the 1980s before. I'm not an expert on the Cuban Missile Crisis. The material I've written here is gleaned from fairly light reading of the subject. I'm sure some of you know more about it than I do. So please excuse me if I oversimplify or make a mistake. As with any "what if" speculation about how history might have turned out if something had gone differently, we'll never know what actually would have happened. It's possible that a US Navy ship could have been destroyed in a nuclear blast, yet all-out nuclear war could still have been avoided. But given the situation at the time, I'm certainly a lot happier that Vasili Arkhipov did what he did, rather than acquiescing to his captain. And of course other people made crucial decisions too: President Kennedy's decision not to invade Cuba may also have forestalled war, for example. But he had many advisors, was thinking of the big picture, and had the authority to speak for a nation. Arkhipov had to do it all alone, against superiors, in the horrible isolation of a submarine apparently under attack. 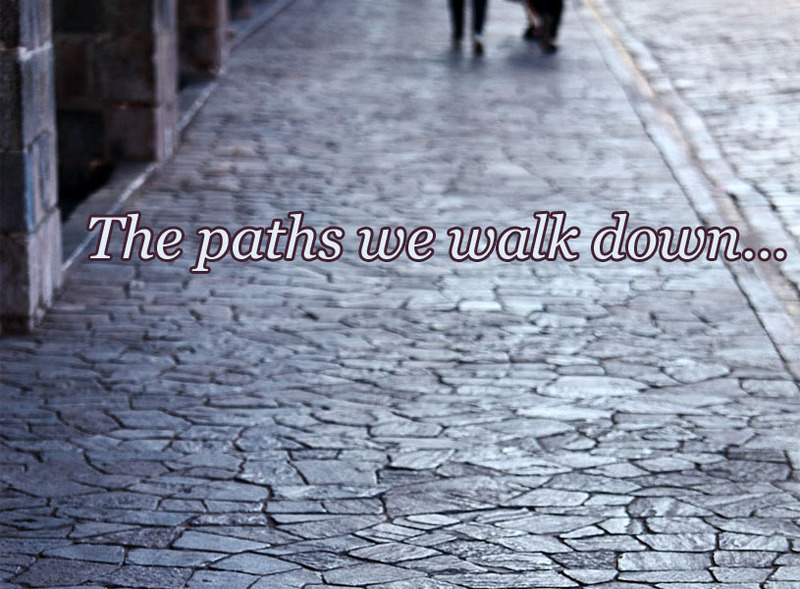 Last Modified: Saturday, 15 February 2014; 15:45:01 PST.